Back in the ‘80s, time-traveling movies were all the rage. And the time traveling always seemed to take place in an ordinary object that was transformed into a magic, time-traveling device. Now, in a throwback/homage to those delightful ‘80s movies (complete with references to Marty McFly, the disappearing Polaroid images, and the harried rendition of “Earth Angel”), there comes a tale of a magic, time-traveling yellow rotary phone. 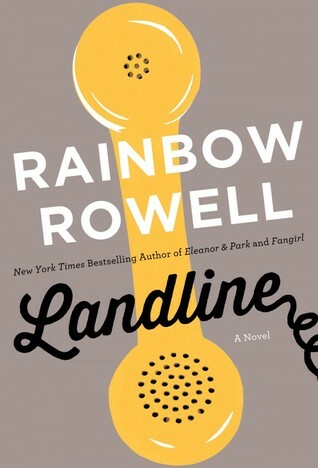 Rainbow Rowell’s new book, Landline , is about a married couple, Georgie and Neal. They’re in their mid-thirties and they have two little girls. Neal is a stay-at-home dad; Georgie has her dream job as a sitcom writer with her (straight male) BFF and writing partner, Seth. But Georgie and Neal are in a rut. Georgie works a lot, and Neal resents her for putting her job (and, thus, Seth) before their family. When Georgie decides she has to stay in L.A. for Christmas to prepare for a meeting about a new sitcom, Neal decides that he has finally had enough. Rather than staying with Georgie in L.A., he takes the girls on their planned trip to visit his mom in Nebraska, leaving Georgie home alone for Christmas. Without Neal around, Georgie realizes how important he is to her. She tries to call him over and over again to tell him, but he never answers his cell. And he never calls her back. Georgie begins to fall apart. Her mom (who thinks Neal has left Georgie for good) insists that Georgie come eat meals at home and stay overnight. Georgie resorts to using her mom’s landline from her childhood bedroom to try to reach Neal. She calls Neal’s mom’s landline in Nebraska from her old rotary phone . . . and Neal finally picks up. But it’s not present-day Neal. It’s 1998 Neal. Georgie decides that this bizarre and utterly unbelievable direct line to the past will provide her the only means by which she can save her relationship with Neal. I really wanted this to be the kind of delightfully fluffy book you can devour in a single afternoon on the beach. Unfortunately, it just doesn’t live up to the hype (and, as indicated below, there’s a fair amount of hype). Yes, it’s cute and light-hearted. Yes, there are some funny moments and cute flirtations. Yes, it reads very quickly (the way a good summer book should). But, largely, it comes off as silly (stupid silly, not cute silly), dated, and hackneyed. Plus, Georgie is self-centered and obnoxious, so it’s hard to root for her. Who should read it: If you liked Attachments , then you should give this one a go. The writing style is the same, the romantic-comedy vibe is similar. But if you’re reading this because you liked Eleanor & Park , you will probably be disappointed. Rowell should stick to YA. Weird, misfit teenagers are much more likeable than self-centered, annoying adults. This entry was posted in Rating: 2/5 and tagged Book review, Book Reviews, Books, Landline, Rainbow Rowell. Bookmark the permalink. Great review! I’ve been curious about this one because I did enjoy “Eleanor & Park” and was wondering if this was worth my time. And curious how Rowell’s talents translated to an adult novel. Thanks! Thanks, Karissa! I think it’s safe to say that your time would be better spent on something else . . . like rewatching Back to the Future. Haha, time spent watching Back to the Future is always time well spent!